What is wireless Home intercom System? An intercom or door phone is a stand-alone voice communications system use within a building or group of buildings. It’s a two-way electronic communication device that contains circuitry for the purpose of transmitting and receiving audio and/or video transmissions. The technology of Wireless intercom allows a telecommunication through a device without need of copper wires between intercom stations. There are many types of wireless intercom systems in the market. Most of the wireless intercom systems operate by using radio waves from one of the frequencies allotted by various government agencies. Some wireless intercom systems communicate using the 802.11 standard. Security: Intercom has always been used at the front door to ensure the privacy and security for the people inside home. Wireless intercom systems are an excellent way to communicate with someone at the front door. It ensures you to open the door for the right person and increases your safety. Easy Portability: Wireless Intercom system gives an easy portability feature as you can shift the position of the intercom without worrying about any wiring system and can shift to any location as per need. Hence, they are also simple to remove if you decide to move to another location. Modernized Security: It gives a modernized security feature to your home or workplace. Easy Communication: If you are living in a very large house that needs shouting to communicate from one place to other then rather than shouting, install an intercom and have an easy communication with the person at other side. This is especially beneficial when you have kids. Be Contented: Wireless intercom gives you a feeling of comfortableness while opening the door as you already know who is outside and for what purpose. 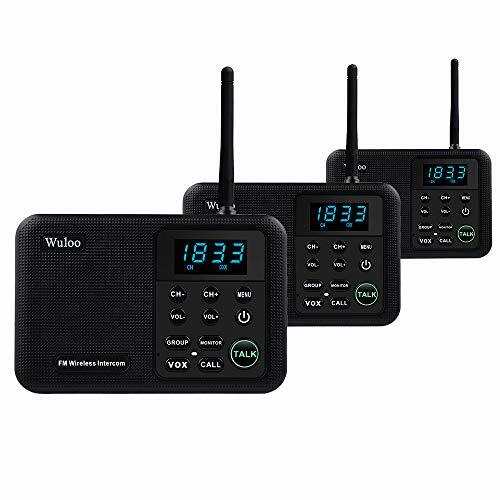 The Wireless Home intercom systems works by using radio waves from one of the frequencies that are allotted by various government agencies. It transmits the voice/video data over the frequency and it transmitted back to the receiving device in the suitable format. Operations are controlled by the master station: power on/off, radio on/off, and call station selection. You can call only one substation at a time or all at one time from the master station and the single station you call is the only one that can reply. Operating frequency range: You should look for the operating frequency range of the wireless intercom as each intercom operates on different frequency range. The common one is 900 MHz that is used for short distance communication i.e. up to 1000 feet. Highest Communication Range: Check out the programmed highest communication range of the wireless intercom device. Look out for your requirement of communication range is getting satisfying in the product or not. Secure Calling & Video Calling Feature: Check for the secure audio and video feature in the product this means the communication should only be limited to you and nobody else is tracking your private communication. Single and Multiple Channel Communication: Check if the intercom is providing facility to communicate with a single unit exclusively, as well as multiple units simultaneously. Most modern wireless intercom systems offer this feature. 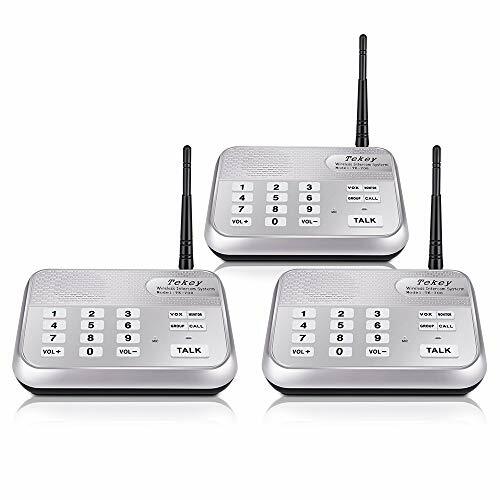 Below we have shortlisted some of the best Wireless home intercom System models that are equipped with all the latest and necessary features that are helpful to improve the security of your home and live life peacefully. The wireless intercom system passed FCC, CE, ROSH Certified. 7 channel secure wireless intercom system. Powerful and Individually Function, Monitor, Talk, VOX (Voice Operated Exchange), Group call function. Monitor function can monitor 10 hours at once. This wireless intercom system can use in a wide range for home, office, outdoor etc. It can support by power bank (5V 1A) so you can take devices to any place you want. It can also work with other brand devices by the same digital channel code. Easy to set up and use, no installation requirement, you can take it to anywhere you want. Monitor function continuously for 10 Hours at once. Full Expandable: Three intercom stations included but you can expand to an unlimited additional intercom stations. You can put the intercom to anywhere, bedroom, kitchen, baby room, living room, elder room, garage etc. You can set up different channel code for each intercom or at same channel code. You can make a group call or a private dialogue to different room. You can monitor the room as you want by using monitor (10 hours once time) or VOX function. This intercom can be charged by mobile power bank (5V 1A). Walkie Talkie System for Outdoor Activity. Excellent Signal and Clear sound quality and long range. 22 channels and 100 digital codes in a secure wireless intercom system. It provides a lifetime warranty for your intercom. Features include Monitor, Talk, VOX (Voice Operated Exchange), Group, and Calling function. Supported by Power Bank for Outdoor: It is compatible with Power Bank (5V 1A) making it easy to take these intercoms any place you want. 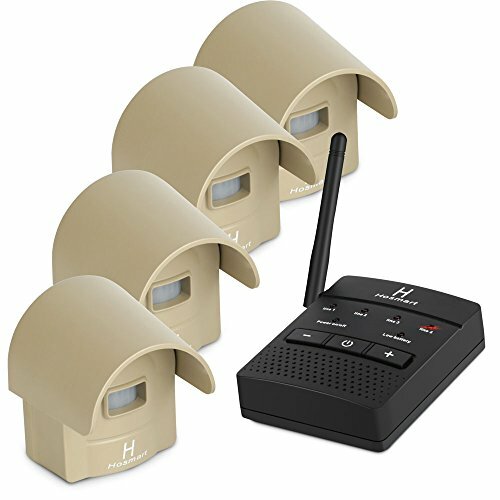 Range over than 1000FT in open area for you to have a safe and effective communication at home and office. It comes with display screen and power key, quick view the channel code and selects the working status. Build in individually / Group call function: One-one / One-to-many communication for calling family or office members, delivering messages, or emergency calls. Monitor mode can help you look after children or elders anytime. Support by Power Bank, it allows you to take devices to wherever you are. It can talk with SAMCOM FPCN10A FPCN30A 2 way radio act as a doorbell system, compatible with FTAN10A FTAN30A Intercoms. Anti-interference to ensure strong and stable reception. VOX function allows your hands free when you are busy and adjust the VOX level could control the background noise. Set up is simple and easy. An enhanced signal with 5280 feet range helps ensure crisp sound quality. 22 Channel and 100 Digital Code: It comes with 22 channels and 100 digital codes in a secure wireless intercom system. 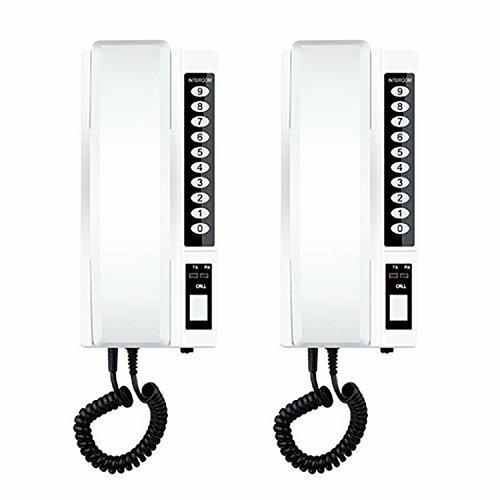 Long Range and Multi-Channel: 2017 new release 1800 feet long range 10 channel secure wireless intercom system. It integrates the latest technology to be the most trusted intercom system for home, office, business. Individually Function and Easy to use: Powerful and Individually Function, Monitor, talk, VOX(Voice Operated Exchange), group call function, monitor function can monitor 10 hours at once. Group function (conference call) can call all the stations in intercom system. VOX (Voice Operated Exchange) function can work all the time until you cancel it. The wireless intercom system works perfectly for you in any place. Wide Using Range and Support by Power Bank: This wireless intercom system can use in a wide range, home, office, outdoor etc. 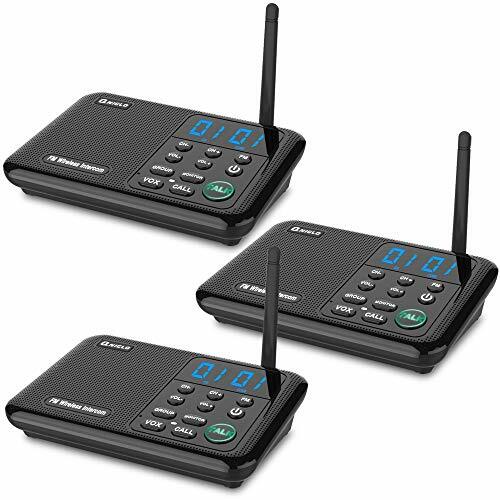 Pass Safety certification and Lifetime Quality Warranty: The wireless intercom system pass DOE VI, FCC, UL, ROSH Certified. Long Rang: Effective distance Approx. 1800 feet(range will diminish based on walls, floors, etc). Easy to set up and use, no installation requirement. Two intercom stations included but you can expand to an unlimited additional intercom stations. You can place the intercom to anywhere, bedroom, kitchen, baby room, living room, elder room, garage etc. This intercom support by mobile power bank (5V 1A). You can take intercom to outdoor, especially where the network signal is poor. Individually Function and Easing Using: Powerful and Individually Function, Monitor, talk, VOX(Voice Operated Exchange), group call function, monitor function can monitor 10 hours at once. Group function (conference call) can call all the stations in intercom system. 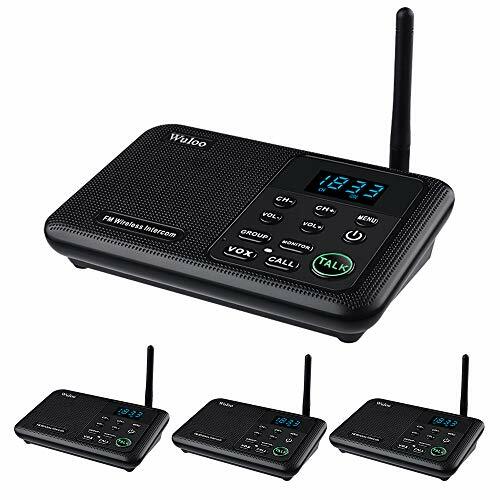 Due to anti-interference signal technology and secret FM digital channel, the wireless intercom system works perfectly for you in any place. The wireless intercom systems pass DOE VI, FCC, UL, ROSH Certified. In order to insure your benefit, it gives you a lifetime quality warranty. Long Rang: Effective distance Approx. 1800 feet (range will diminish based on walls, floors, etc). Built in rechargeable battery and hence works with or without electricity. No need telephone wires: avoid the hassle of running cords from room to room. Easy to use: pretty simple plug and play. Scalability: support lots of units and channels, up to 99 units can be added to its system. Long working range: up to 800 meters (2600 feet). Keep in mind that obstructions such as walls and windows will reduce effective range. Clear communication: deliver sharp & clear voice for communication, no delay, no echo sounds. Auto Squelches & HD Sound: The auto squelches function of Qniglo wireless intercoms systems ensure you can hear the clear sound. If there is signal interference, please change the channel. Long Range & Multi-Channel: Qniglo wireless home communication systems has long range communicate distance. Clear Display Screen & Simple Use: The display screen is more convenient when you set the channel and easy use at night. You should connect the power supply firstly, and then set the same channel, then press the ‘TALK’ key, after you speak release the key. 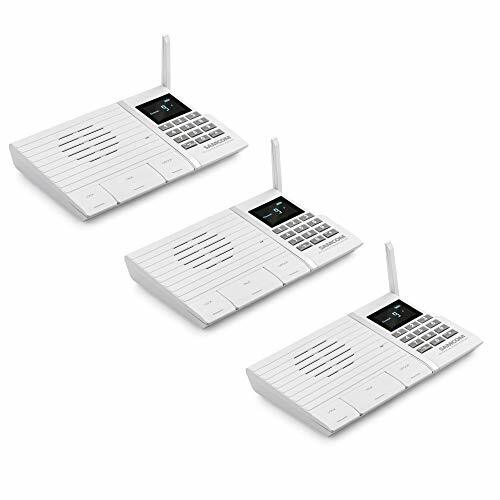 The wireless intercom systems suit for home and business office. Take care of your family in any room or downstairs to upstairs, call your workmate in the office room. Warranty: It provides 12 month warranty and 30 days money back guarantee.